“Crystallize Violin Sheet Music” by Lindsey Stirling, “ Crystallize Violin Sheet Music” for Violin and Piano, Original key: D Minor, number of pages sheet music PDF: 8, Video cover song Crystallize Violin Sheet Music. “Crystallize’” is a song by American dubstep-violinist Lindsey Stirling from her self-titled studio album, Lindsey Stirling. The song Crystallize was released as a music video on YouTube on February 23, 2012. The video proved to be a success, with more than 42 million views at the end of the year, and was the eighth-most watched video of 2012. Crystallize became Lindsey Stirling’s album’s lead single due to its success. 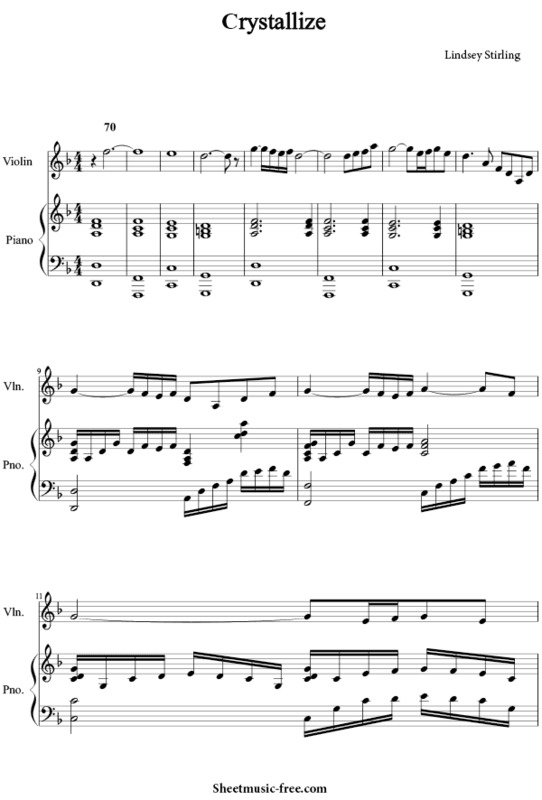 Crystallize Sheet Music Lindsey Stirling. Lindsey Stirling rose to prominence following a breakout appearance on Season 5 of America’s Got Talent. She was voted off in the quarterfinals after Piers Morgan told her the world had no place for a dancing Dub-Step violinist. However she proved him wrong, firstly by attracting a lot of fans with her choreographed violin performances on her YouTube channel, then when her eponymous debut album reached #23 on the Billboard 200. The album also charted within the Top 5 in Germany, Austria and Switzerland.